Hear them roar. 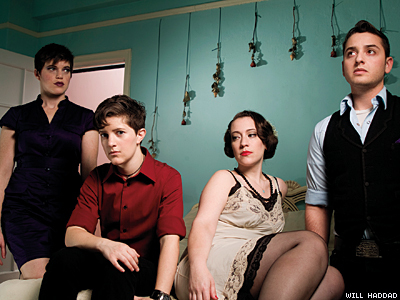 Many of today’s queer female bands are grappling with their riot grrrl legacy. When people hear the Shondes for the first time, they’re often struck by the Brooklyn-based punk band’s driving, Pat Benatar–reminiscent sound, and the violin, expertly wielded by one of the gender-tweaking foursome. And then there’s the name: the Shondes. Shonde rhymes with Rhonda, and it’s a Yiddish term meaning disgrace. And yet they’d all have it no other way.